Recent years have witnessed increasing interest in the relationship between economic development and poverty. An important reason for this has been the establishment of the Millennium Development Goals, which have set poverty reduction as a fundamental objective of development. The main factor explaining the salience of poverty reduction as a development goal is, in part, ethical. It is indeed widely considered ethically unacceptable that a large part of the world population still does not have the resources to achieve a basic level of living standards in an otherwise increasingly affluent world. The most frequently advocated manner to achieve poverty reduction is through economic growth. Yet, growth is understood to be necessary but not sufficient to ensure a sustainable reduction in poverty. To do so, it must be inclusive in the sense that the poorest populations participate in and benefit from the growth process. Recent research has demonstrated that growth can vary tremendously in its power to reduce poverty, both across countries and over time. Its short-term and long-term poverty effectiveness depends on the structural changes that accompany the specific growth process. Even for those episodes in which growth does reduce short-term poverty, it is found in the literature that not all growth is equally inclusive of the poor. Hence, if one is interested in sustained poverty reduction and inclusiveness as an objective of development, then it is not enough to focus solely on growth. Setting inclusiveness of growth as a development goal has three advantages. It reduces current poverty. It increases the impact of current growth on current poverty. It can finally increase future growth. Analyzing whether and how growth can be inclusive also enables a better understanding of long-term poverty. Long-term poverty is often linked to the difficulty for segments of the poor population to participate in the growth process, for example by finding better-paid employment in a growing sector. There is mounting suggestive evidence of the existence of poverty traps as higher return occupation or technology implies large sunk or fixed costs that are beyond the reach of the poor. Moving out of agriculture, where poverty rates are often much higher, is one example of such choices. Labor market participation, especially by women, who have, on average, lower possibilities to access loans, assets, new technologies, and lesser education, is another example. Any structural or policy induced trend that facilitates these transformations (i.e. shifts to higher value-added occupations and feminization of work) should foster pro-poor growth. In this context, governments seek evidence and tools to assess the distributive impacts of alternative growth strategies. In this book, we develop and apply a new approach to simulate both the economy-wide impacts of such major investments and their household-level income and consumption impacts. More specifically, the approach combines a dynamic computable general equilibrium (CGE) model – which captures macro impacts as well as changes in prices, factor returns and employment – with a microsimulation analysis that maps these impacts to individual and household-level decisions and resulting incomes. CGE models are widely recognized to be the best tool to conduct policy simulations of macroeconomic shocks and policies and to map out their impacts on specific sectors of production, factor markets, consumer prices, international trade and public finances. Indeed, governments in both developed and developing countries now routinely use CGE models to conduct simulations before enacting major policy reforms. Yet, the CGE literature is surprisingly poor in capturing growth – arguably the most important macro-economic shock or policy – including, for example, the dynamic impacts of trade liberalization through factor accumulation, technological diffusion, efficiency gains and increased foreign direct investment. The macroeconomic literature has been far more productive in modeling growth, as these studies have been effective in capturing properly the transmission mechanisms between the economic environment and the accumulation of primary factors as well as productivity change. Yet these macro models are too aggregate to track down the more disaggregate sectoral and factor market impacts necessary to analyze the distributive consequences and, in particular, the participation of poorer populations in the growth process. Most of the dynamic CGE models found in the inclusive growth literature are sequential in the sense that they are simply multi-period static models linked by a simple adjustment of the stocks of primary factors from one period to the other. In these models, saving and investment decisions, which are crucial in the growth process, are determined in an ad hoc manner like in static models, since households and firms do not for example take into account the future in their current-period decisions; they are myopic. This type of modeling strategy is unsatisfactory, as it does not make it possible to assess properly the impacts of government policies on factor accumulation as well as on their efficiency. Sequential CGE models cannot adequately capture the transmission mechanisms between changes in policy environment and investment decisions that are crucial for a good understanding of the growth and distributive impacts of the proposed policy changes. There is a crucial need to develop a framework for policy analysis that can solve these deficiencies of recursive CGE models. Intertemporal CGE models constitute a good candidate, as they provide a more realistic framework for modeling these crucial saving and investment decisions. Intertemporal CGE models assume that households and firms can behave rationally, for example by integrating their expectations of changes in current and future policy instruments or variables into current decisions. They can thus provide a coherent framework for analyzing changes in the economic environment that affect the accumulation of factors of production and their respective rates of return (wage rates for different categories of labor, returns to land, returns to capital…) over time. The set of accumulable factors that intertemporal models can analyze is not limited to physical capital alone; these models can be used to analyze household decisions to invest in education (human capital) and hence government policies that affect, for example, the cost and returns to education. In the same vein, intertemporal models can be designed to capture the productivity effects of government spending on infrastructure. Once the growth impacts are properly modeled and their impacts on key variables are correctly assessed, the poverty and inequality implications of proposed policy changes can be properly assessed using microsimulation techniques based on household survey data. We believe that this is an important methodological advancement since we are not aware of any model that examines the growth and distributive impacts of government policies in an intertemporal framework. This approach is applied through the analysis of the distributive impacts of infrastructure investments in three large and divergent Asian countries: China, Pakistan and Philippines. Indeed, among possible growth strategies, investment in infrastructure is key. Infrastructure bottlenecks – in the quantity and quality of roads, railroads, ports, airports, communication facilities, etc. – constitute major constraints that increase the cost of purchasing inputs, bringing produce to markets, circulating information, networking among economic actors and that generally thus discourage investment and growth. Business surveys repeatedly cite infrastructure among the central criteria in national and international investment decisions. Yet little is known about the distributive impacts of these investments and of the various mechanisms used to finance them. Indeed, governments can finance new infrastructure in a variety of ways – domestic or foreign loans, increases in a variety of taxes, cuts in other types of spending, etc. – that can be expected to have highly divergent impacts on poverty and inequality. 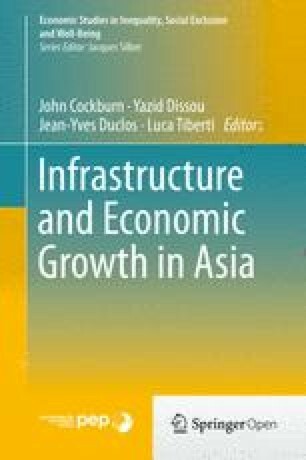 The studies reported in this book develop and apply a rigorous framework to analyze the short- and long-term distributive impacts of infrastructure investment and of these different financing mechanisms in the case of three fast-growing Asian countries. The book begins with a summary of the current state of the art in terms of theoretical and empirical analysis of infrastructure investments and their relationship to economic growth. This sets the background for the three case studies. The first of these sets out the methodological framework used in all three countries, before applying it to the specific case of the Philippines. This is followed by applications to the cases of China and Pakistan. The book ends with a conclusion that compares and contrasts the key findings. Beyond its contribution to the understanding of the growth and distributive impacts of infrastructure investments and their financing, the book constitutes a first step in providing tools to allow governments and other stakeholders to examine the role of other important growth strategies such as those that include investments in human capital (for instance, through education and health), research and development, agriculture, among many others. Finally, this book is novel in another way. All three country studies were conducted by teams of researchers born and living in the countries they are analyzing. This gives them a unique and detailed understanding of the local economic and political context, which deepens their analysis and embeds their analysis and recommendations within local realities. Indeed, this book is the outcome of a program of research established by the Partnership for Economic Policy, a global network working to strengthen and promote a stronger voice for local researchers in national and international development policy debates. PEP is financed by the Department for International Development (DFID) of the United Kingdom (or UK Aid) and the Government of Canada through the International Development Research Center (IDRC). This particular program of research received separate funding from the Australian Agency for International Development (AusAID). We thank participants in several PEP general meetings, the 2013 GTAP annual conference in Shanghai, the 2013 GDN annual conference in Manila, the 2012 international conference on CGE modeling – “Urbanization and Sustainable Development” – in Beijing and the 15th Sustainable Development Conference – “Sustainable Development in South Asia: Shaping the Future” – in Islamabad (2012) for helpful comments. We also salute the support and advice provided by governmental and non-governmental counterparts in all three study countries.